Stop digging for what you need at the bottom of your sewing basket! Organize your sewing, scrapbooking, crafts or art necessities so they're at your fingertips and within easy view with the Art Bin Super Satchel with 12 Compartments. This oh-so-handy translucent, acid-free polypropylene storage bin features both fixed and adjustable divided compartments to hold a variety of supplies. Plus, it's stackable, so buy more than one and keep supplies close by for when creativity strikes. I am a beader and make jewelry as a side business. 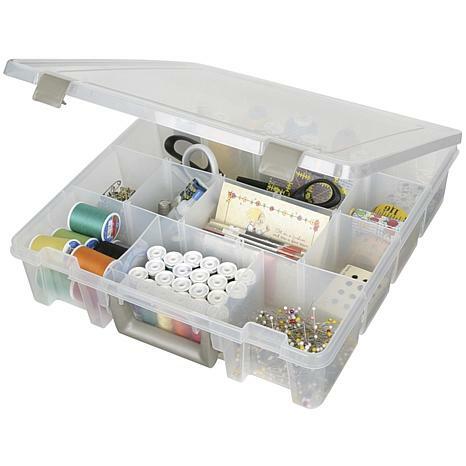 I bought this to help me organize my beads and metal findings and was amazed at how much it holds. 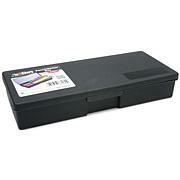 It is a great quality item, not the cheap plastic like you sometimes find in the craft stores. I love that I can choose whether or not to divide up the rows by inserting the dividers too. I would recommend this to any crafter with a lot of small things to keep track of. I will probably come back for another soon. These are perfect storage boxes. I got two of them and they are great for packaging my smaller scrapbooking pieces to take on the road for crop nights. 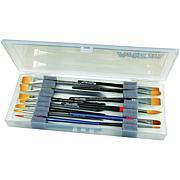 This is a good size box, nice depth to it and holds a ton of supplies. I'm delighted with it. My other 1/2 is disgusted with the price I paid but to me, it was worth it! 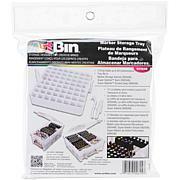 I have a lot of these Art Bin Organizers because they keep my craft supplies organized and dust free. 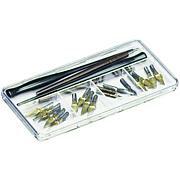 What I like about this paticular Organizer is that I can adjust the size of my compartments, great for my embossing supplies but can be used for a lot of different supplies. My only problem with these organizers is that my husband and sons have found that these work well for their things too.